Pusheen a chubby gray tabby cat that loves cuddles, snacks, and dress-up. As a popular web comic, Pusheen brings brightness and chuckles to millions of followers in her rapidly growing online fan base. This detective Pusheen clip-on backpack plush was inspired by a popular web comic, and features a tweed pattern cap and cape that's perfect for sleuthing. 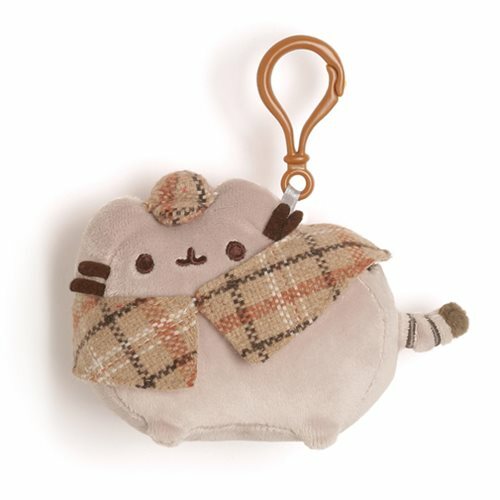 The Pusheen the Cat Detective Pusheen Clip-On Backpack Plush measures approximately 4 1/2-inches long. Ages 1 and up.